12-3pm, lots of fun things for the children and adults to enjoy. 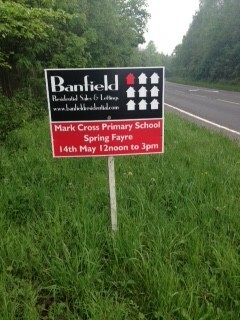 We support the Friends of Mark Cross School in advertising with our boards around the Mark Cross and Crowborough area. All of the schools in the local area are fantastic and we are delighted to be helping support them. Have you seen our boards, can anyone guess how many boards we have out there? We have officially moved office! Kelly welcomed a beautiful baby girl into the world! Congratulations Kelly! We are very excited to announce that we will be moving back to our original office in the High Street!